The surplus is high enough to last for a few more months, meaning that prices will continue to fall till the end of this year. This marks an inflection point in the egg market. In 2015, the H5N1 (avian flu) outbreak in the United States lead to large scale culling, resulting in reduction of flock size and a huge surge in price. Immediately after the passing of the outbreak, producers engaged in a race to expand flock size and gain market share, resulting in the largest combined flock size ever by the end of 2016. Since then, demand has not kept pace with supply and prices have come crashing down. 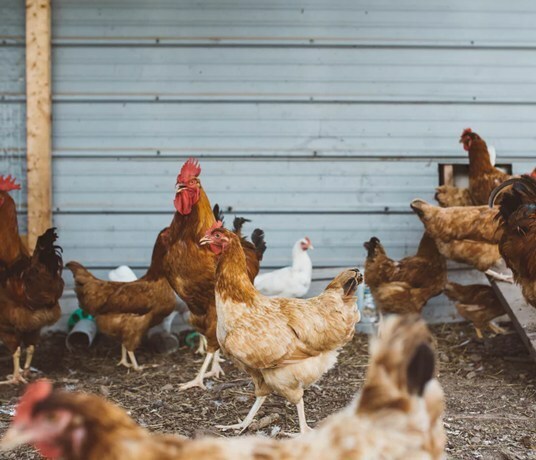 Some farms have scaled down since the second quarter of 2017, but the average age of hens is lower, leading to higher production for a particular flock size. Another factor that is influencing flock size has been looming over the horizon for the last few years. A progressively greater number of consumers are realising the inhuman plight of hens in caged barns. Continued lobbying from animal rights campaigners is leading to a progressive shift to cage free eggs. As​ ​much​ ​as​ ​75%​ ​of​ ​all​ ​output​ ​will​ ​be​ ​cage-free in​ ​2050,​ ​in​ ​contrast​ ​to​ ​14%​ ​now,​ ​Jones​ ​estimates. Average retail price for a dozen eggs was $1.414 in may, the lowest for the month since 2006, according to data from the bureau of labour statistics. The price fall has been a record 52% from $2.966 in September 2015. The U.S Department of Agriculture predicts a further drop of 6% by the end of the year. This is at a time when projected inflation rates for the end of the year are hovering around 2%. The slump has negatively affected Cal-maine Foods Inc, the country’s largest egg company. Share prices have plummeted by 12% in 2017, the worst start to a year since after the 2008 economic bust. Adam Samuelson, an analyst at Goldman Sachs Group Inc., downgraded the recommendation on the Cal-Maine stock to sell from neutral on June 16. 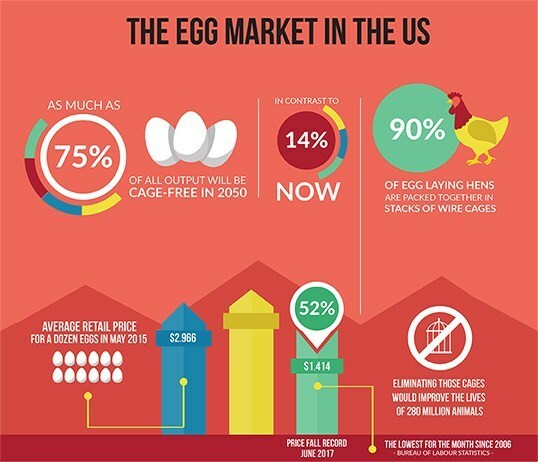 “Historically, the egg industry has experienced many boom and bust cycles with periods of overproduction disrupting the supply-demand balance.” Cal-Maine CEO Adolphus Baker said in a presentation earlier this year. He suggested that the current slump may not last. “High prices cure high prices” by promoting supply, “but low prices also cure low prices” by incentivising suppliers to cut back on inventory. Nationwide, farmers have reduced their flocks by about a million a month, USDA data reveal. The silver lining for producers is that demand is expected to pick up before the end of the year. As Fall progresses into Winter, consumers tend to eat more hot breakfasts that include eggs. At the same time, holiday cooking and baking gives a boost to egg sales, which rises during Thanksgiving, according to Elam of FarmEcon. At present, farmers aren’t reducing their flocks fast enough to have a substantial impact on prices. At the same time, even with smaller animal numbers egg production is rising because the hens are younger and genetically more productive, said Knox Jones, a dairy analyst at Advanced Economic Solutions. The shift to cage free eggs comes as large restaurant chains such as McDonald’s Corp. have pledged to move to cage-free eggs to meet growing demand from consumers focused on animal welfare. This industry wide move to cage free barns is adding a further drop in prices as farmers are unable to trim flocks. The shift is the culmination of a major humanitarian movement that leads to a necessary upgrade in the living conditions of hens. Currently, about 90% of egg laying hens are packed together in stacks of wire cages so small that they cannot spread their wings. Eliminating those cages would improve the lives of 280 million animals, while not costing consumers all that much more, proponents say. The switch is complicated because it requires retrofitting barns or acquiring permits to build new ones and ordering specialized equipment from the few manufacturers that produce them. However, premiums for the product could also start to disappear as they become more the norm. Farmers are “unprofitable right now, but they find themselves in an awkward situation” Knox Jones said.”They should be producing less to ease the glut, but they also need to be expanding their flocks of cage free animals”. ​It works out well for the producers too, with margins climbing steadily over time. The greatest beneficiary of this all is perhaps the humble hen, who provides millions of homes across the country with their daily dose of cost effective protein several times a day.